Box Dimensions (LxWxH) 6.8 x 6.0 x 2.6"
155 Double Ball Joint Head with Camera Platform is rated 4.8 out of 5 by 38. Rated 5 out of 5 by Anonymous from Ball-joint head & super clamp combo I bought this combo in order to mount a camcorder to my bike in a variety of ways. This setup gives me the flexibility I was looking for to do that. The super clamp is great for odd shapes and angles; the ball joint has enough versatility for angling the camera according to spec. One downside: when some spots are tight, the handles on the clamp and head are too long. I thought of a hacksaw to trim them up a bit. One upside: the handles on the clamp and head are long :) The user can really crimp it down tight and feel confident that the device is going nowhere. On a bike that's important as I don't want to be worried about any of it; just press 'record' and get on with the ride. The build is intensely sturdy; I don't worry for a second that my camera is secure; even on roads that are bumpy (even speed bumps won't move the position). Rated 5 out of 5 by WJD from I would buy this item again. Easy to use and is solid when tightened down. Holds a 5D III with a 24-70 lense with no problem. Rated 5 out of 5 by TPG from Great Accessory I use these to support my camera in places where a tripod is not feasible, or times when I dont want to carry a tripod. They can be clamped to almost anything tubular or with an edge (within the jaw opening range), such as fence posts, chair legs, edge of a desk, etc. The double ball joint allows almost any camera orientation, regardless of the orientation of the support. These are useful for many other items such as background poles, lighting equipment, or almost anything, photographic or otherwise, within the weight rating of the clamp. Rated 5 out of 5 by ProPhotoTraveler from Reliable, Solid, & Highly Recommended I've used this camera mount over a dozen times on studio shoots to get the camera high up above the subject, aiming straight down for a birds-eye view. It works great, and it's very dependable. You need to really work it to get it to stay tightly, but that should be obvious. Once it's in place, it holds an EX-1 solidly for hours at a time. The price is unbeatable for the indie filmmaker. Rated 4 out of 5 by Anonymous from good set up. i've used this in conjuction with a Bogen Super Clamp. the joints have proved to be solid for use with my light weight digital camera. i'm not sure how well it would work for larger, heavier equipment. i find the assemply a bit bulkier than i'd like, or it should be, but generally good. i also have used this with a flexible goose neck between the ball head assembly and the super clamp. this set up offers nice flexibility but the goose neck is not strong enough to hold the weight of the head and camera without external assistance. 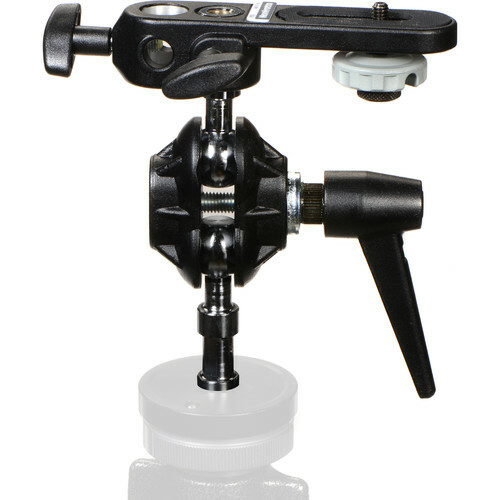 Rated 5 out of 5 by El Cayuco from Buy It..... You can even mount it on a low end tripod w/ two diffrent screw mounts. platform can be used on both ends. you wont be stuck with a pan head tripod. this will give you the ability to swivel your camera. Rated 5 out of 5 by David from Great for creative shooting! This works great. I had my Canon XSi mounted to my mountain bike. I mounted onto the handlebar and even low onto the suspension fork. I was apprehensive because I didn't want to damage my camera incase it came loose. It was rock solid the entire time. I never did any aggressive trail riding and after each series of shots I would alway check to make sure everything was tight. Only twice one of the bolts loosened slightly and the mount still held the camera up. I did find the long handle to interfere with some of the setups I tried. I liked the length because it provided more leverage to make sure it was tight. However, I wouldn't mind if it was slightly shorter so it wouldn't hit the camera platform. You can work around it, but you'd be compromising the kind of shot you're looking for. I'm planning on getting an extension rod so that I can get a wider shot from the bike. I also used this on another shoot where I used this clamp to mount it onto an 8 foot ladder so that I could shoot from a high angle. I'm just starting to discover the uses for this and I can't wait to try some more creative uses for it. Rated 3 out of 5 by Superfly Photos from Works as advertised, except for sticker Works as advertised, but after 2 days in my camera bag the padded sticker (for buffer between mount & camera) fell off and stuck to my flash. Now I have sticker residue on my flash, and can't trust that it'll stay on without having to glue it in place. Not well thought out... Only other complaint is that this combo is very heavy. Carrying this with a superclamp is not much of an advantage over simply carrying a tripod.